I think the best gifts are often the most unexpected. The small and unexpected things that a friend might give, a family member or something like that? We all expect gifts to show up on our birthday and around Christmas, but some of the best gifts are the ones that come out of the blue because someone was thinking about you. 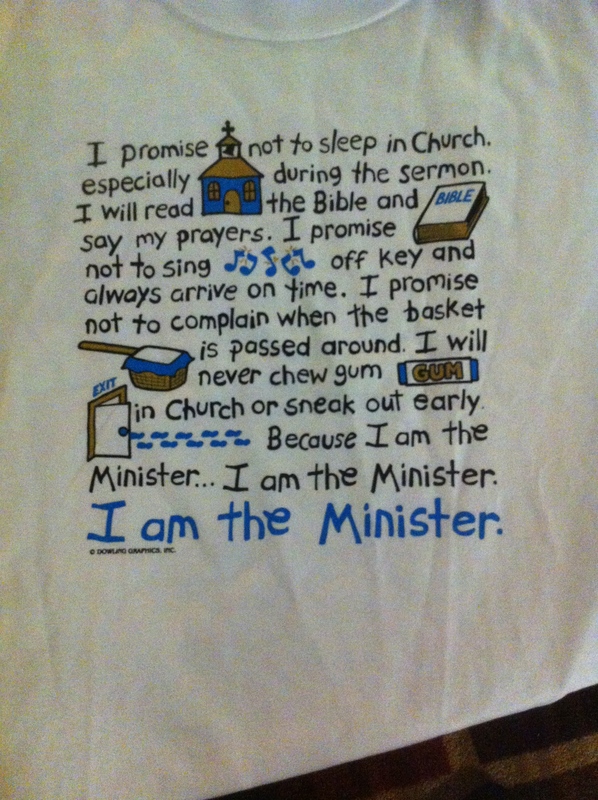 This week I went over to my mom’s house and I found this from one of my Aunts – a T-shirt for pastors. She had seen this shirt and not only thought of me, but acted on it and bought it for me. It’s often these type of small but incredibly meaningful gifts that leave an impact. It’s showing up with a coffee for a friend when they least expected it. It’s having a book delivered to their house that you thought they’d enjoy. It’s a T-Shirt about ministers that reminds you of them. The point is we should be showing our care in creative ways. It doesn’t have to be expensive or large ways; it has to be intentional and thoughtful ways. And that’s what this shirt means to me – an intentional and thoughtful gift – which are always the best kind. So why not take a second and think about someone you could surprise with a gift this week. And then actually make it happen, and spread some love and hope.